Tinder is a strange place. You may not hit upon a match for months. But sometimes even when you do and get into a conversation with the match, you may not feel like taking the conversation forward. If only somebody could console Twitter user Sab (@sabwow) by saying something comforting about this simple fact. 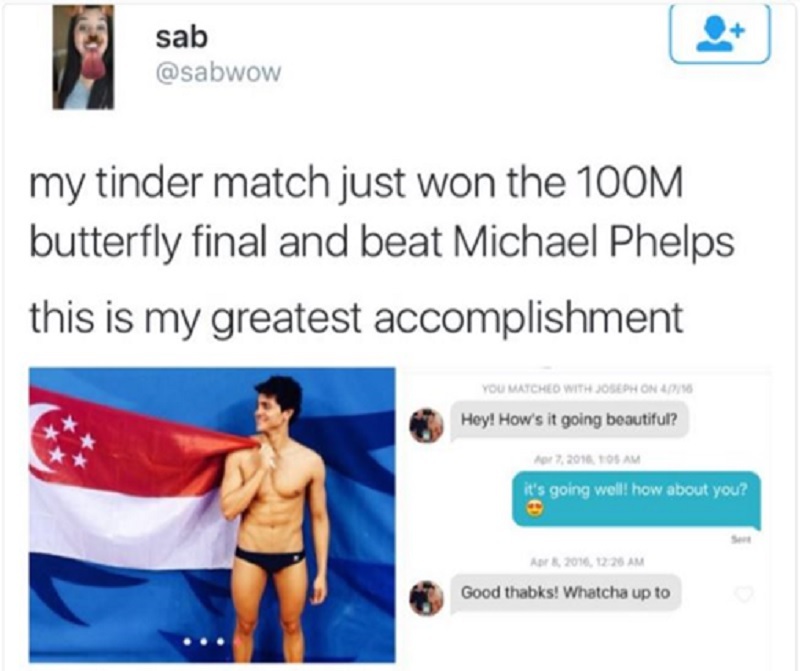 As it happens, she matched with a guy called Joseph Schooling back in April of this year but even after exchanging a message, decided against pursuing him. Of course, the fact that Schooling just beat Michael Phelps in the 100m Butterfly event and won Gold made her realize what she had lost on and then Twitter happened! The hilarious story exploded on Twitter and now Sab is getting equal measures of consolation and back-handed offensive tweets calling her a gold-digger. Of course, she is unperturbed by the measure of negativity. Maybe Schooling could try consoling her?